The voice recorder lets you wireless listen into all audio Live, the device includes earphones that you can wear whilst listening, the microphone can be placed at any location and function as a hidden device. The convenient feature known as Voice Activation allows the device to efficiently record audio efficiency also plays the role when this device lets you customise the audio quality with three different audio modes, but what allows you to have the control over this device is the built-in LCD screen, you can navigate and view data thanks to the display screen. What makes this recorder a gadget is the amount of features it has, the wireless microphone allows up to 100m within range of recording but nevertheless the long-lasting battery is what makes this device ultimate, with 350-hour long battery you can record enough audio to fully fulfill your need for this device. This is not your average voice recorder, this voice recorder has everything you need to make up your ultimate gadget. The design built of this recorder was specially constructed for people who desired something that was convenient and easy to use, with built-in speaker you have ability to use this device as an FM radio player. Small wireless microphone with telescopic antenna which transmits audio signal up to 100 meters allowing you covertly to put it a room and record. It give you option to record and listen at the same time. The dimension of MIC is only 45x25x11mm . With voice activation recording you save voice recorder's memory and battery. It starts recording once voice are detected. The voice recorder base has a built-in rechargeable Li-Ion Battery which gives up to 350 hours continuous recording. 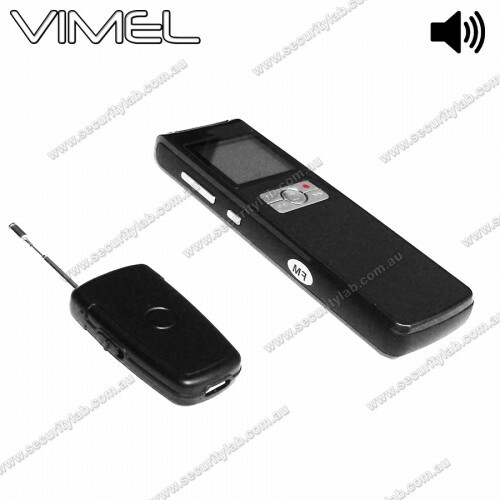 The wireless MIC has own small rechargeable battery with up to 3 hours transmitting time.